learning off the build blogs of all the others! Ok, so I'm staring nearly 4 months after the official start in January - but I'm going to blame the weather for being too awful and the garage too cold! A great advantage of this late start is I've been reading a lot of the other blogs and have made lots of notes especially off the "2013 Mass Build - general chat thread". 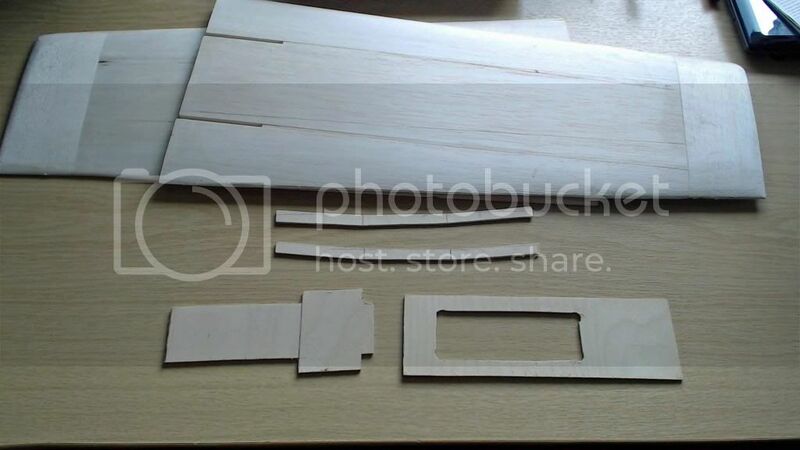 wood for wing panels - page 39 long discussion! retro fitting birch / ply doublers a pain - page 52.
which are my notes up to the end of March. So a big thank you to everyone else who has been posting about their builds and taking part in the discussion thread - I'm hoping it will save me some head scratching which I'm sure I'd hit otherwise. 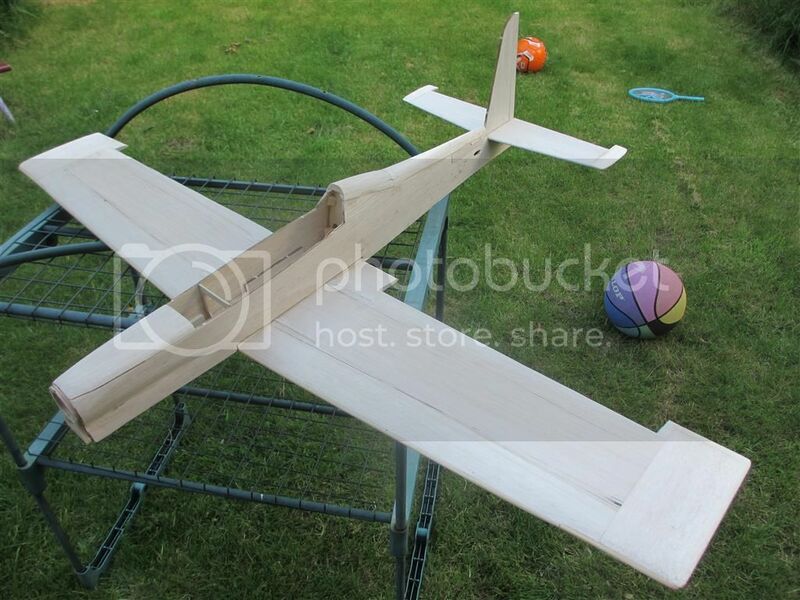 I've built one other balsa aircraft from a kit - a Philip Noel Designs Tigercat which appears in my avatar - which was lovely but which took me so long to build I thought I'd never complete it or be too scared to fly it when I did finally complete it. So for this build I want to finish quickly and not worry too much about minor details with the aim of rapidly completing it and seeing it fly. Having the blogs of so many other people to read before starting certainly helps this aim. This week - the wings which seemed to be very straight forward. and for the motor and servo's I'm going to try and re-use a load of bits I had left over from a defunct Multiplex acromaster. 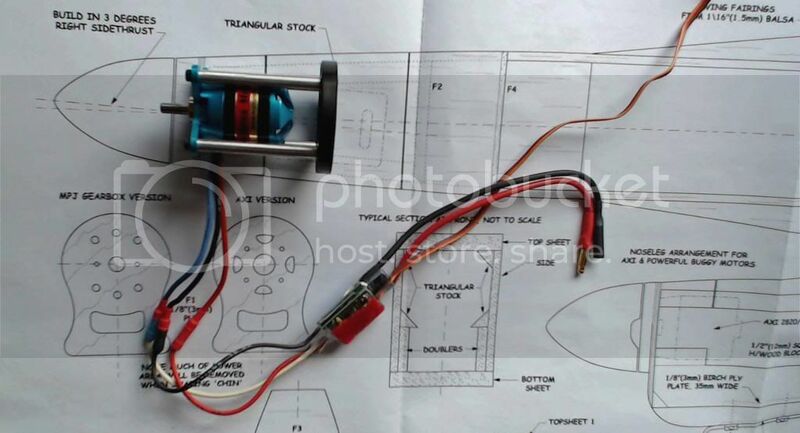 The motor is a multiplex HCS 3516-1130, 134 g, should swing a 12 x 6 prop at @350 watts. I want to back mount it rather then have all the motor weight hanging of F1 so had to buy a multiplex firewall mount for this. 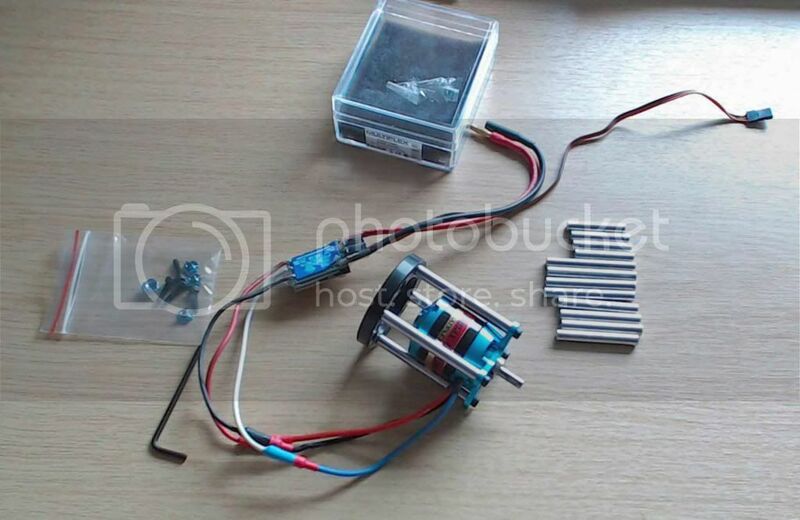 This cost £20 ( I know I could have bought a complete motor and mount for that money !!! ) but allows me to re-use stuff rather then buy again. The mount comes with different lengths of motor mount sides to allow you to adjust the length from firewall to motor mount front. Luckily it looks like it will just fit on the plan. Using the very longest motor mount sides I think I can get the large black firewall mounting ring in between the fuz sides. I'll try and sort out the servo mounting next and probably have a bash at the fuz next week. Looks like you've made a good start already James. Excellent work on collating the useful information from the main thread. I was thinking about doing that soon for when I start mine in a month or so, but now I can just use your index so thanks! Look forward to seeing your plane come together. Where did you get the motor stand off from? this could be handy for a different project of mine, once I get to start it! Yes well done summarising a very long thread - just in time since I'm a late developer too . Yeap very handy index - well done and thanks! Thanks for the comments on the usefulness of my index on the general discussion thread. I was unsure if it would be useful to other builders or not so I am very pleased to get the feedback from IanH, Ian Jones and BEB. And its good to know I'm not the last to start building! I'll update the 'index' again when I've read through the latest posts on the general discussion thread. Looking good James and a double thank you for creating the table of contents at the top. I'm forever loosing things in that thread! Note managed to do any work this week but here is my updated Index to the 60 page General Discussion forum - very interesting long post by the designer Nigel Hawes on page 60 about all sorts of things. 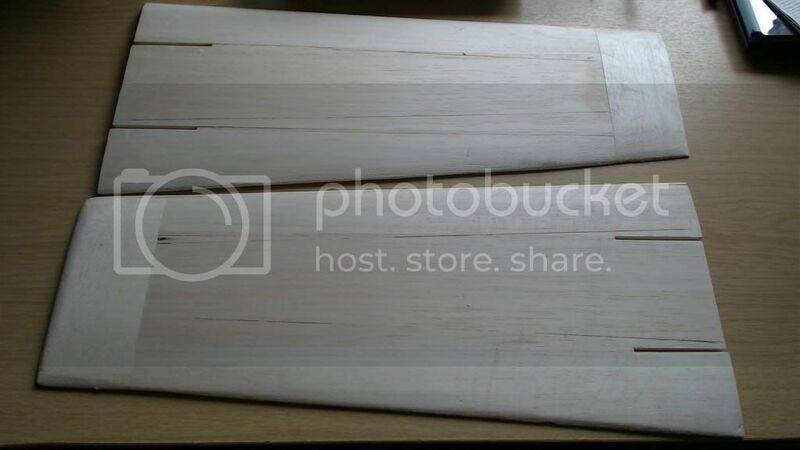 retro fitting birch / ply doublers a pain - page 52. what are these? Anyway a weekends worth of cutting, sanding, fettling, lining up, cutting and generally not progressing very far but actually doing lots of work relating to preparing for assembly has got me to this stage. 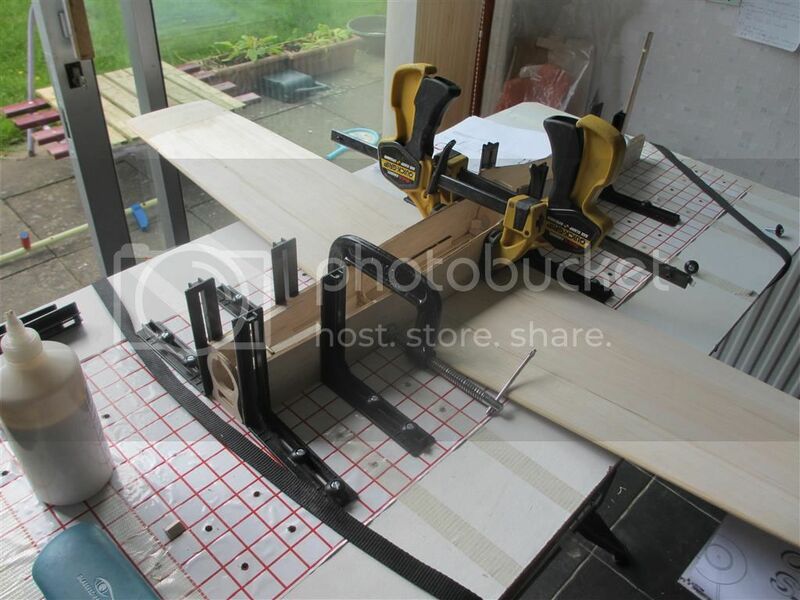 I've been referring loads to the build blogs of Woolston flyer and Phil Winks whose detachable wing mod I'm using. I think this stage was probably the key assembly step for the fuz so confidently expect to have these all finished by June. Looks good so far! 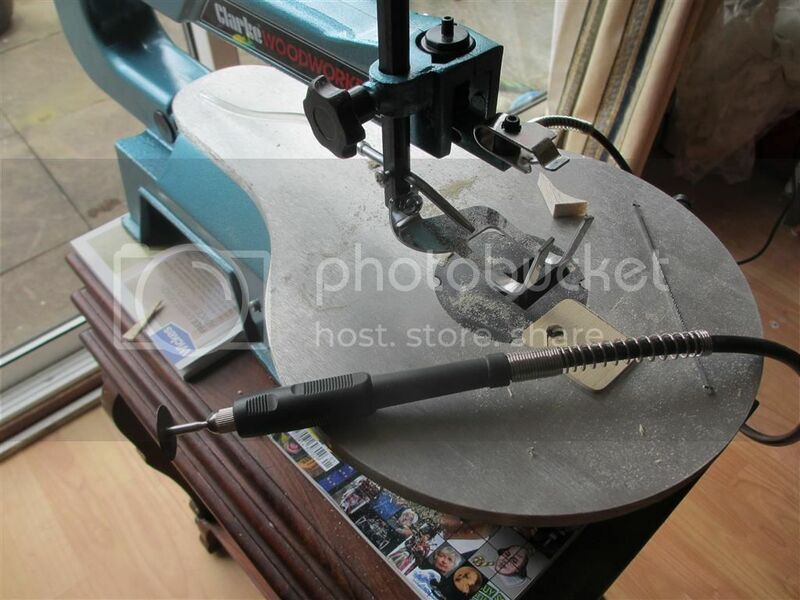 I have been thinking about getting a scroll saw or a mini table saw, not sure which one to get. My Tucano is stood in the corner of my home office, half of the covering done. I don't seem to be able to find time to work on building models at the moment. Well done getting stuck back into it james - Greenacres this year maybe? Posted by Phil Winks on 01/06/2014 15:08:06:..
Phil - ref the dust - I set up my new pride and joy in the lounge....lots and lots and lots of dust everywhere! I take your point about needing a mask for extended work with balsa. Also agree on your other comment on the quality of the kit - feels very nice and solid. WolsonFlyer, not sure what is best for you, with my scroll saw I was able to create cut-outs in the fuz formers easily which is something you can't do with the table saw although I imagine the table saw is much better for straightforward cutting as the blade can't wander around like the scroll saw does. Understand about the problems finding time to fiddle with models, I've had an enforced lay-off from doing other things for a week and the model came to the fore as I couldn't attend to the other jobs I was meant to be doing! cheers BEB - we'll I've nothing on the Greenacres weekend, I'll have to think about it! Decided today a bit windy for enjoyable R/C flying so spent most of the day building. Cracking on James - looking good!